^ 魏明通. 核化學. 五南圖書出版股份有限公司. 2005: 191–. ISBN 978-957-11-3632-5. ^ Decay and Half Life. [2009-12-14]. ^ Mould, Richard F. A century of x-rays and radioactivity in medicine : with emphasis on photographic records of the early years Reprint. with minor corr. Bristol: Inst. of Physics Publ. 1995: 12. ISBN 9780750302241. 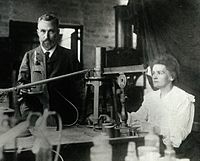 ^ Marie Curie – Scandal and Recovery (1910–1913) Part 2. American Institute of Physics. [7 November 2011]. ^ The Council of the European Communities. Council Directive 80/181/EEC of 20 December 1979 on the approximation of the laws of the Member States relating to Unit of measurement and on the repeal of Directive 71/354/EEC. 1979-12-21 [2012-05-19].